In the village of Thiepval, the town hall has a plaque indicating that the firm Finney and Broadhurst built it in 1931 and was also responsible for the village church. This was intriguing and led us to believe that the firm built the memorial for Lutyens, too. Research in the CWGC archives, in a memo dated 13 August, 1931, revealed that Finney and Broadhurst of Rue des Quatre Coins, Calais — who were “already on site and have their plant there”, following a site visit by Lutyens — were awarded a further contract for horticultural works due to their “very reasonable” tender and a “saving on the original constructional Bill of Quantities and the amount provided for contingencies has not been encroached upon”. I am grateful to Sarah Camerlynck, CWGC Conservation Supervisor WEA, for this research. The firm also acted as concessionaires of the Hennebique reinforced concrete system, with which the core of the memorial was built. 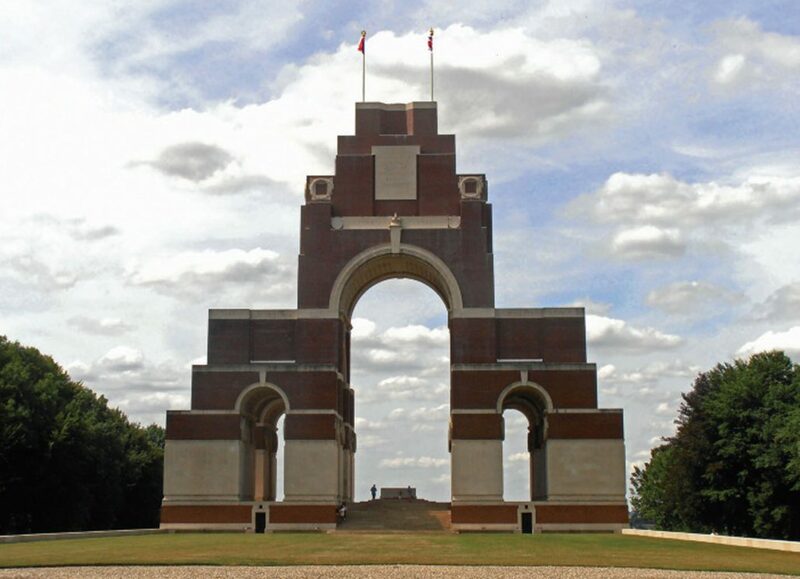 Five men named Finney are recorded among the Missing on the walls of Thiepval. One was a pupil at Wye Agricultural College in Kent; its memorial plaque records a Finney who gained a prize for surveying, bookkeeping and construction, who died on the Somme. It would indeed be poignant if he were the son of the builder of the memorial.